Librarians and educators, have you dealt with any book challenges or bans in your workplace this year? Now’s the time to help the American Library Association and the Office for Intellectual Freedom collect this vital information to compile their annual list of most frequently challenged books. Every year more and more books have become the targets of challenges at schools and libraries across the United States. In 2014, it wasn’t just novels and children’s books that were contested, though. Critically acclaimed graphic novels like Marjane Satrapi’s graphic memoir Persepolis, Brian K. Vaughan and Fiona Staples’ sci-fi epic Saga, and Raina Telgemeier’s fun coming-of-age tale Drama were also part of the top 10 books challenged that year. In order to bring awareness to this alarming trend as well as to better educate the public on the dangers of banning books, the ALA is calling for all citizens to report any challenges that they experienced by Friday, February 26th. 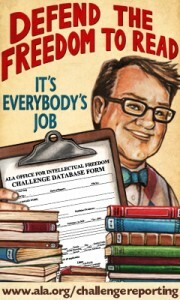 The more information that can be collected, the better we will be able to defend everyone’s freedom to read. Click here to find out how you can report a challenge and check out CBLDF’s collection of information, resources, and tools that you can use should you need to defend banned books in your schools and libraries.